AVProConnect's 18Gbps 4K60 4:4:4 4x4 matrix switch (AC-MX44-AUHD) is now shipping. The matrix switch features Toslink audio output support up to Dolby 7.1, DTS & LPCM, built in scalers, on-board audio delay control and more. This switch equalizes and amplifies the output to ensure the HDMI signal can be transmitted through long HDMI cables without loss of quality. Fully matrix-able audio allows you to move the audio signal independently from the video signal at any of the de-embedded audio outputs. 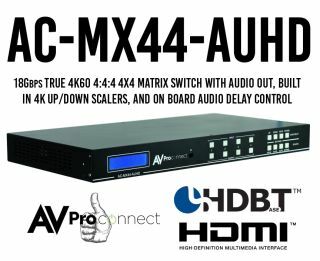 The AC-MX44-AUHD is a true 4x4 HDMI matrix switch. Supporting HDMI 2.0(a/b), HDCP 2.2, up to 4K video resolution, and up to 18 Gbps bandwidth. This switch allows any source (Blu-ray, UHD Blu-ray, satellite receiver, game consoles, PCs, etc ... ) to be shown on any of the connected displays. This matrix equalizes and amplifies the output to ensure the HDMI signal can be transmitted through long HDMI cables without loss of quality. Audio Delay is “On-Board” so you can manage lip-sync issue before it is a problem. All that with Full EDID management allows maximum flexibility with today's wide mixture of sources and displays.